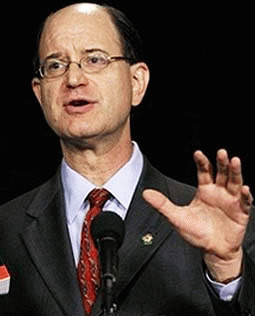 Congressman Brad Sherman of California's 27th congressional district told the House in a speech on Thurs evening that several fellow Congressional representatives have said they were threatened with the prospect 'Martial Law' should they vote in opposition to the $700 billion bailout. Congressman Sherman's revelation comes after multiple claims that this threat was being ramped up to aid the now $850 billion bail out through the House this past Friday. According to numerous Congressional testimonies, the stark panic atmosphere which has gripped both Congress and the US media was intentionally created in order to 'fast-track' a financial bailout bill. Several members of Congress were told before Monday's vote that martial law might be instigated in America if the legislation failed. During his speaking time on Thurs, Congressman Sherman stated explicitly, "Many of us were told in private conversations, that if we didn't pass this bill on Monday, the sky would fall, the market would drop two or three thousand points, another couple thousand the second day, and a few members were even told that there would be Martial Law in America if we voted no(to the bail out bill)." Earlier this week, Congressman Michael C. Burgess from the 26th District of Texas, went public on Monday stating live on Infowars nationwide radio broadcast, that House speaker Nancy Pelosi had declared House Rule 136A, effectively putting the House under "Martial Law" rules, a dictatorial measure only activated during times of national emergency. Analysts and Congressmen alike have equated these threats to "fearmongering" and described as a form of "economic terrorism" carried out by powerful banking interests in order to secure the record $850 billion payout to the banks by the American people. Physical Martial law may be invoked by the President of the United States in case of any deemed "state of emergency". Martial Law has not been put into practice since Lincoln, where several Congressmen were arrested or put under house arrest. In 1878, Congress passed the Posse Comitatus Act, which forbids military involvement in domestic law enforcement without congressional approval. However, both the Military Commissions Act of 2006 and USNORTHCOM has increased its direct involvement with US civilian administration. Additionally, the John Warner Defense Authorization Act of 2007, and President Bush's recent PD51 may possibly rescind previous limits by suspending Government as well as other Constitutional guarantees such as habeas corpus. Watch Rep. Sherman’s full speech at CSPAN.